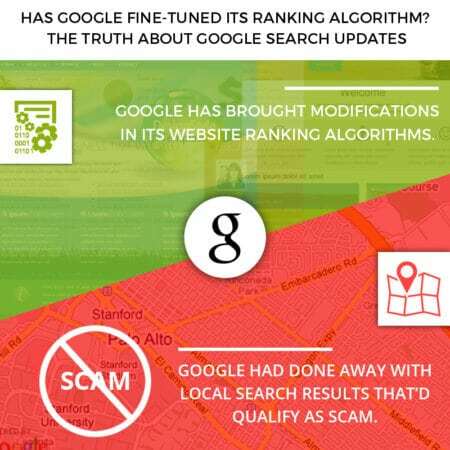 Has Google fine-tuned its ranking algorithm? The truth about Google search updates. Grapevine has it that the world’s most admired and popular search engine-Google-has brought modifications in its website ranking algorithms. Although the California-based behemoth has not made any formal or official announcement of this development, the search community is abuzz with rumors that an update is on the cards or has already happened. On your end, you can check out for yourself whether such an update has indeed taken effect by searching for your site on the Google Chrome browser. Do you continue to see the URL link to your site on the same page as you used to? Has the URL link graduated upwards or moved lower down the page or has been relegated to the 2nd page? To be specific, there’ve been two updates and both within the last 24-hours or so. The main update had to do with the crux of the search engine’s ranking stratagem-the prioritizing of websites on the SERPs and the next one bordered on localized standing or positioning. At the cost of iteration, there’s no confirmation yet from Google about these updates but SEO strategists and specialists have gone on record by attesting that they’ve observed a rearrangement in the website rankings. Significantly enough, this reorganization in the standings is not industry specific but across-the-board. The tracking tools used for conducting search ranking drives including Alogoroo, SERP Metrics, Accuranker and Mozcast have also witnessed updates, adding more grist to the rumor mills. At the other end of the spectrum, forums and communities on local search positioning have seen members discussing animatedly about these updates. A great majority of local SEO specialists are of the opinion that the updates have to do with quality improvement. They’ve formed their opinions after observing that Google had done away with local search results that’d qualify as scam. Consequently, there has been a shift in the local search results owing to the redrawing of the quality enhancement criterions. However, a good proportion of the bandwagon of SEO cognoscenti strongly believes that the update has to do with refreshing the ranking algorithm related to local search. The fact that Google has maintained a strict upper lip and is yet to come up with a proclamation confirming or negating such updates is fueling curiosity on this matter. Now as long as the premier search engine doesn’t clear the air on this front, rumors and gossips will keep doing the rounds. Call Local SEO Tampa Company at 813.358.4498 if you are concern about your website ranking drop. Next PostNext Planning a Short-Term SEO Strategy: Is It worth the Trouble?